Football season has kicked off! That means that more often than not I’ve got a house full of people on Sunday watching the game and looking for something delicious to chow down. When Josh comes off the field he is HUNGRY! A go-to for me is always a bottle of Stubb’s BBQ sauces. I love keeping tailgating simple and look to add flavour with a quick hit of BBQ sauce as I finish grilling meat on the grill or with a marinade the night before the game. Stubb’s sauces are a super-easy way to add flavor to whatever I’m grilling. Stubb’s entire line is certified gluten-free and contains no high fructose corn syrup – which I love. If you want to know the awesomeness of Stubb’s, then come join the conversation on Twitter. 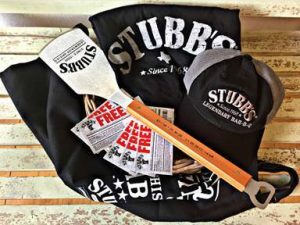 Let me know your favourite thing to cook up when the gang comes over to watch football and you’ll have a chance to win a prize pack for some Stubb’s swag and coupons for free Stubb’s sauces and marinades. 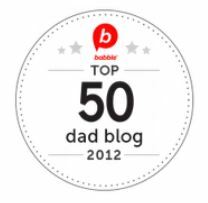 I was not compensated in any way for this post or giveaway. All opinions are my own. Add beef, chili powder, onions, and garlic to a large stock pot. Cook until all of the beef is browned. Once browned, add in the beer and beef stock to and deglaze the pot. After deglazing, add in the remaining ingredients and stir. Let simmer covered for thirty minutes, stirring occasionally. Preheat oven to 400°F. Spoon 1 cup of chili into each jam jar. Top with 1/4 cup of cornbread batter. 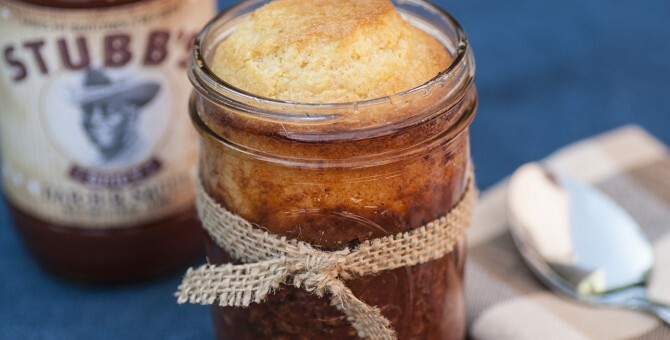 Place jars on a baking sheet and bake for 10-15 minutes, until cornbread is golden brown. Let chili rest for 15 minutes before serving. I love weekends in the warm spring and summer months. It means I have a chance to get my smokers out and smoke anything I can get my hands on. Chicken, salmon, turkey, sausages… They are all delicious. 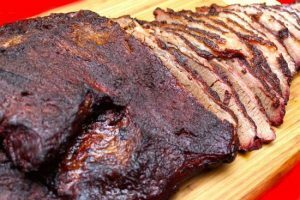 But I have a special place in my heart for smoked brisket. It’s one of the greatest things to eat and it’s really a labour of love. My go to recipe can be found here. The only thing is, smoking a couple of briskets can take anywhere from 8 to 13 hours. Not a small undertaking. I’d love to tell you that I light up my smoker, settle back into a lawn chair with a bucket of cold beers and spend the day relaxing. But alas, I have a wife, 3 kids, a job, a house, and a dog. All of thes are vying for my attention and sitting in the backyard for an entire day is really not in the cards. For those of you who’ve never had a chance to own a smoker, it’s all about cooking food low and slow. The smoker temperature has to hover around 225 degrees for the duration of the cooking. This is traditionally done by opening and closing air vents. Let more oxygen in to swirl around your glowing coals and the temperature rises; limit the air in the smoker and the temperature drops. It’s not rocket science, but it does require some monitoring and babysitting. Smoking also requires keeping a close eye on the temperature of the meat being cooked. Cook it to too high of a temperature and you risk drying out your prized smoked meat. This can be complicated as different cuts of meat on different levels of the smoker will cook at different rates. Accuracy. 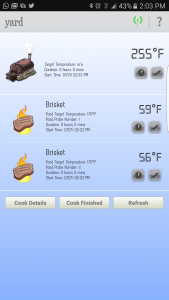 The BBQ Guru monitors the temperature of the smoker, AND the temperature of up to 3 foods that are cooking on the smoker. This means that at any given time you can see exactly what the status is of every part of your smoke. No more guessing. Mobility. The CyberQ has a great display unit that sits near the grill – but the game-changer is that it synchs to your mobile device via WiFi. That means anywhere you go in or around your house you can easily check the status of your smoke. Alerts. Food temperatures can be set and alarms will sound when you get to the desired temperature. Smoker minimum and maximum alarms can also be set so that you know as soon as your temperature drops or spikes. Critical in inclement weather. The deal breaker. The guts and glory of the BBQ Guru is an external fan that connects to one of the vents of your smoker. If the temperature of the smoker lowers, the fan kicks in, increasing oxygen flow to your coals and bringing the temperature up. If the smoker temperature rises too high the fan cuts out, dropping the temperature of the smoker. The BBQ Guru takes all of the hands-on tinkering out of the equation. All you need to do is kick back, relax and reel in the compliments when it’s all said and done! I’ve been smoking meats for nearly a decade. The CyberQ changed the rules of the game – all for the better! 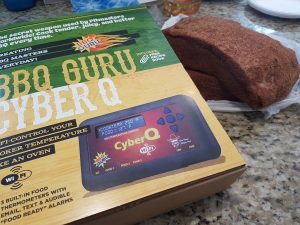 If you’d like a chance to win your own CyberQ send me a message on twitter (@gavmartell) and let me know the favourite thing you make on your smoker. Contest closes August 19th. Retail value ~$329US. Papas rellenas (on Spanish literally: stuffed potatoes) are a popular type of croquettes found in Peru and other Latin American countries. They are similar to a Jewish knish but vary in that the outer layer is mostly mashed potatoes. Knish generally have a much higher flour content to be more of a dough with either little or no potato. The Papas Rellenas have a crisp outside, followed by a fluffy and light layer of mashed potatoes, hiding a delicious, flavourful centre. I love making these in bulk and watching everyone I make them for devour them. They also freeze really well if you are so inclined. Give them a try and serve as an appetizer at your next get together! In a large saucepan add potatoes and cover with salted water. Bring to a boil and then reduce heat, cooking until potatoes are just tender, about 20 minutes. Drain potatoes and mash with salt and pepper, to taste. Allow to cool. While potatoes are cooking, in another large saucepan, heat the olive oil over Medium heat. Add onions and green pepper and cook until onions are soft, about 5 minutes. Add the garlic, and ground beef and cook until the beef is browned, about 10 minutes. Salt to taste. Break up the beef while it’s cooking so everything is a fine consistency. Drain off any fat. Add the wine, tomatoes, chili powder, cumin and pepper, and cook until the mixture is dry. Remove from the heat, and allow to cool. When potatoes and picadillo are cool, beat the eggs in a small bowl, and put the bread crumbs on a large plate. Using your hands, form 2 tablespoons of potatoes into a ball and press an opening in the centre. Stuff with meat mixture, then add potato to cover the opening. Roll to make a neat ball and then dip into the egg mixture. Dredge with bread crumbs to cover thoroughly. Refrigerate the balls for 30 minutes. Heat vegetable oil to 375 degrees. Add the balls a few at a time and cook until golden brown, about 2 minutes per side. Serve hot or at room temperature.